It was, what Oprah calls, an "Ah-ha!" moment for me. I asked him to repeat it a few times so that it would be engrained in my brain. Sounds easy enough. But this is so much more than the literal act of physically showing up. As often as I drag myself out of bed some mornings, fighting the urge to just disappear for a day, I do physically get myself to work. But is that enough? In my heart of hearts, I don't think it is. I think that showing up is more than that. It's being present. Showing up is getting there, wherever "there" is for you, so that you can be available for whatever twists and turns life brings you. It's living in the moment –– not preoccupied with what you wish you were doing, what you need to do tomorrow or regretting what you didn't do yesterday. Showing up is shutting off the tape in your brain that is constantly making mental notes and little judgements so that both your physical self and your mental self are in the same place at the same time ready to tackle or enjoy whatever is right in front of you. Showing up is the only way you can even attempt to pay attention. I like to pride myself on being a good listener. But the fact of the matter is, I used to be a good listener. Back in 2009, following major surgery, I had an allergic reaction to ampicillin which started a degenerative hearing loss. Due to this hearing loss I sometimes find my attention drifting or I fill in the blanks with what I think people are saying because I didn't hear all that they said. Sometimes it's frustrating. Sometimes it's amusing. But always I'm fearful that it comes off as not paying attention. Sometimes it's a lot harder to pay attention than I think it should be. In a world where multitasking isn't only acceptable and encouraged, it's often required, the art of paying attention is getting short changed if not altogether lost. I multitask. A lot. Only half paying attention to stuff going on around me while the other half of my brain is desperately trying to focus on whatever task I have at hand. Some days, I utterly fail at multitasking as my attention span can be easily shifted or cut short as I flitter from project to project sometimes not even finishing any one task and ending the day feeling completely exhausted with little to show for it. Those are the worst days. So what to do about it? My goal is to learn to clear my head and simply focus my attention on listening to the quiet. Just five minutes a day. We can all do that, can't we? Be still and in the moment, paying attention to our heartbeat, the sounds of the neighborhood as life happens outside our front door? Yes. I think that's doable. I have a reputation for not holding back. I don't know how that happened because I actually feel like I hold back a lot, afraid to speak my truth for fear of judgement. Rewind. Let me clarify. It all depends on the situation. Sometimes, I can be very opinionated about certain things. Sometimes, if it's a subject matter I'm passionate about or possess some level of definitive knowledge about, then I speak up more times than not without even being prompted. But is that the same as speaking my truth? I'm not entirely sure. There are a lot of situations that come up, at work and in my private life, in which I keep quiet. I bite my words. I hold my tongue. I swallow my pride. Bite. Hold. Swallow. Such harsh, definitive actions. And I'm guilty of doing them. Often. Or I'll say, "I don't know." How many of you say that? Such an easy copout. The very definition of non-committal, wouldn't you say? A way to answer without answering. I know when I say it, often, even if I'm not 100% certain, I at least have an idea, an inkling of an opinion. Perhaps one that will be too harsh, too unpopular, too polarizing. Or one that might seem dumb or unsophisticated. Then the fear of being made to look like less than I present myself takes over and I stay silent. Or say, "I don't know." There is, to be sure, nothing wrong with saying "I don't know" in situations when you truly do not know and don't want to speak falsehoods. In fact, those times, it's better to admit to not knowing in hopes that someone else does and you might actually learn something. But those other times, those times when you do it to deflect, to hide, to pass the responsibility of making a decision or sharing an opinion onto someone else? Then those times I believe are the situations I need to learn to speak my truth. To be authentic to myself. And most importantly, to learn to do it without it being at someone else's expense. "Let me show you another way." Isn't that lovely? That's how I want to learn to speak my truth. I want to be able to speak up gently, kindly with authority balanced by humility because I do so yearn to be the most authentic self I can be. There has been much in my life that I have had little to no control over. As a result, there are things, odd things sometimes, menial things that I have become a control freak about. To the point that often, I won't attempt something because I can't control it's outcome. It's sometimes overwhelming, this fear of not knowing whether something I might attempt will succeed or not. If I can't do it well, if I can't control the circumstances around me, I just don't try. It's a difficult thing to admit to the world because it's often a difficult thing to admit to myself. But if I'm being truthful about wanting to attempt speaking my truth, attempting to be more authentic, then the confession is a necessary one because, surely, I can't be alone in this even though it often feels like I am. Learning to let go of the outcome is probably going to be the most difficult thing for me to adopt. It shouldn't be, since I profess to have faith. But see, that's where this gets tricky because when it comes to the big things, the life and death things, my faith is stronger and I'm able to say, God's will be done and let things go. But the smaller, more immediate things, the "what should I do with my life" things concerning my life's passion, my art, my relationships or rather, lack there of, that I have a hard time with. I spend so much energy trying to control things: anticipating every possible obstacle, planning for every possible outcome or taking a familiar path because I don't know where the other will take me. That's wasted energy that could be directed towards living in the present. And even now, as I type this I have difficult time trying to stay focused and not judge myself or edit my thoughts as they flow from me to the keyboard to this post. My impulse was to type, "What a shame" that I'm wasting all this energy. "Shame." I'm judging myself just by thinking that. So, yes, this cycle will be the hardest to overcome. So I'm going to practice the art of surrender, to extend my faith into ALL areas of my life and believe that the universe knows best without additional input from me. My task will be to show up, pay attention, speak my truth and rest in the knowledge that whatever the outcome, I did the best I could do. 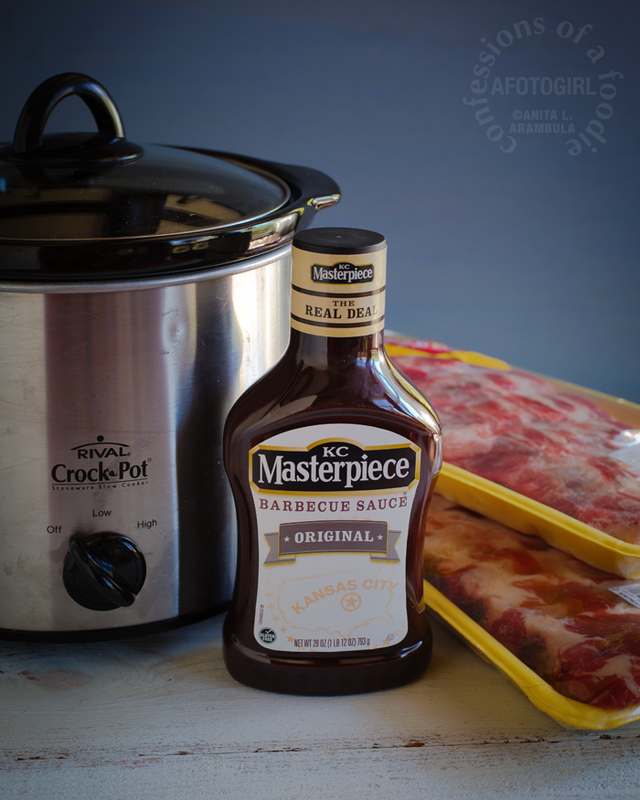 These fall-off-the-bone ribs are so simple because the crockpot does all the work for you. 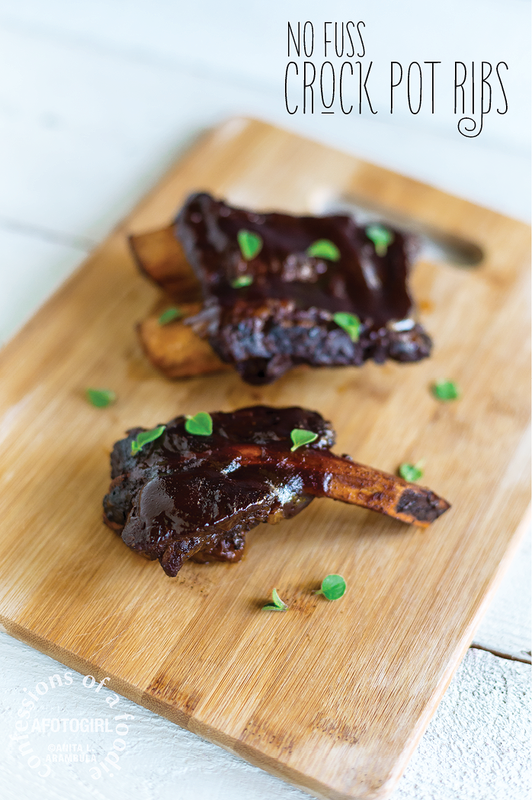 Don't shortchange the outcome by skipping the last step of broiling because the caramelization and char add that finishing touch to this faux barbecued ribs. 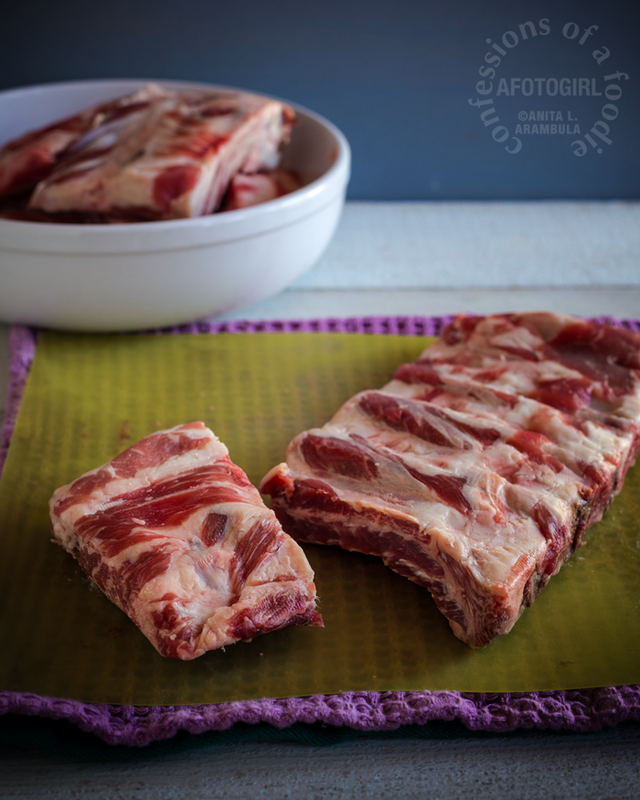 Cut the ribs down to smaller portions so they fit into a 4 or 5 quart slow cooker. 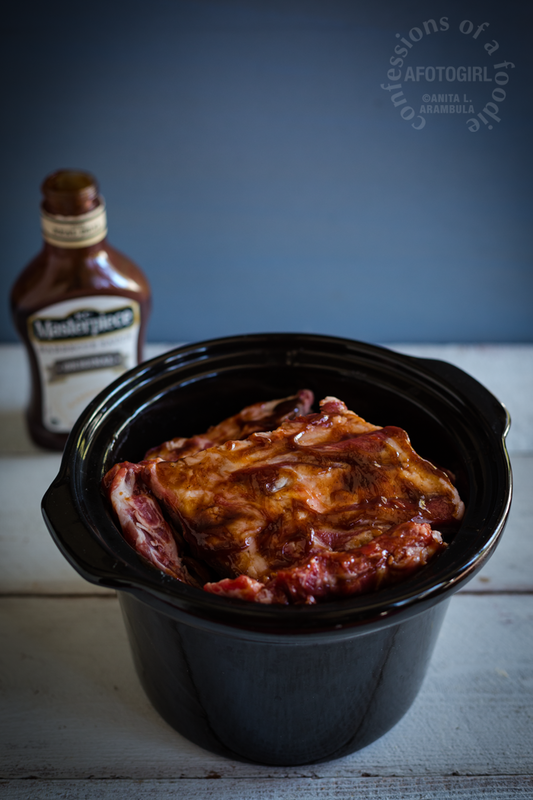 Brush ribs with sauce, coating both sides and layer into slow cooker. 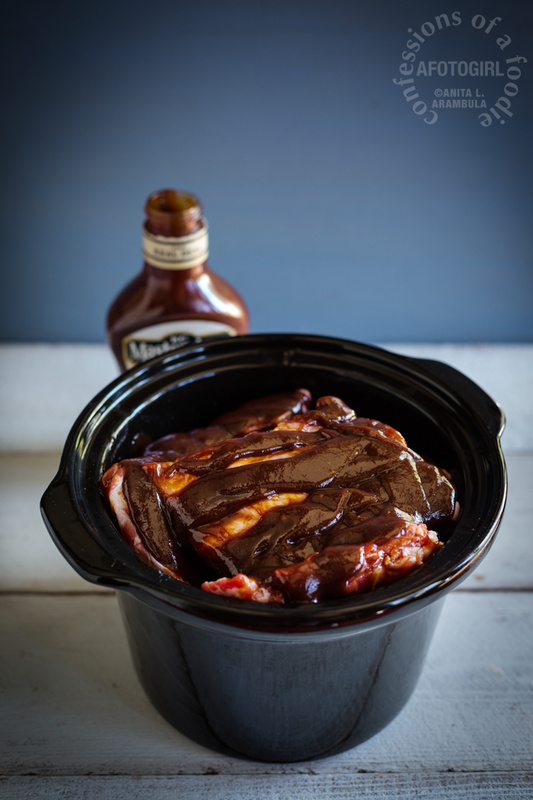 Pour all but ½ cup of the sauce into the slow cooker and cover. Cook on high heat for 2 hours. Remove ribs to a large rimmed baking sheet and return to the slow cooker in reverse order so the ribs that were on top are now on the bottom. Cook on low for three more hours. Turn oven on broil. 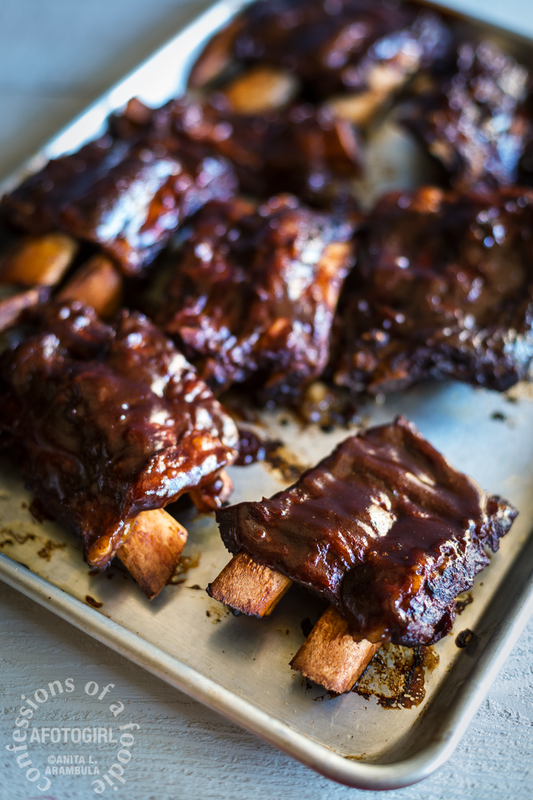 Arrange ribs on a large rimmed baking sheet and brush with the remaining ½ cup of sauce. Broil for 4-6 minutes or until the ribs just start to char and caramelize. Remove from broiler and allow to rest for 8 minutes before serving. Alternately, these can be finished on the grill instead of the broiler. Prepare the grill grates with nonstick spray, then fire up the grill and heat to medium high. 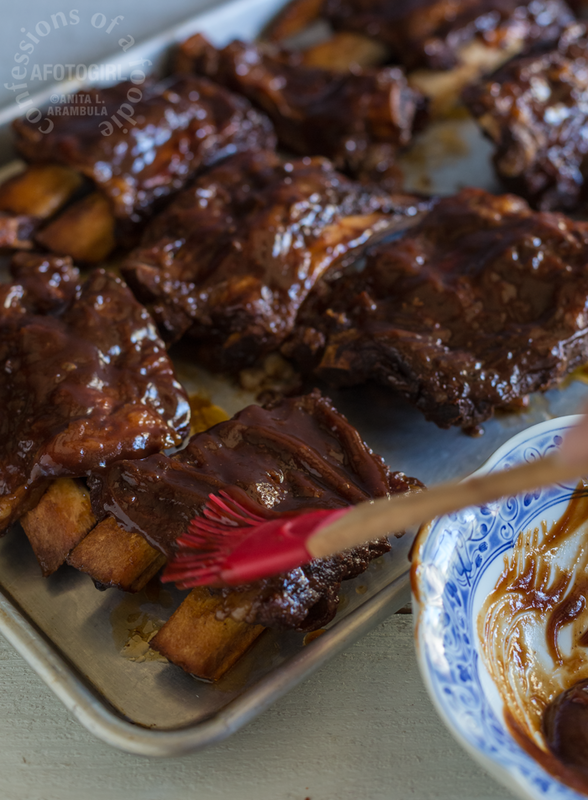 Brush ribs with remaining sauce and grill for a few minutes on each side so that the ribs char and caramelize. Remove from grill and let rest before serving. First, these look and sound so simple and delicious! 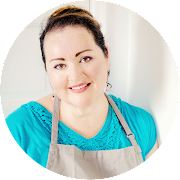 Second, I know you read my good friend Cheryl's blog "5secondrule" for that fab line, "Let me show you another way." I can't wait to tell her! She is the best, as are you. What delightful synchronicity. Jill, I do read "5secondrule"... love it. I did link to her post in the paragraph so people could go read that awesome post she did on "Let me show you another way." Profound!